Photo courtesy of fellow CDTer Elisabeth Chaplin. 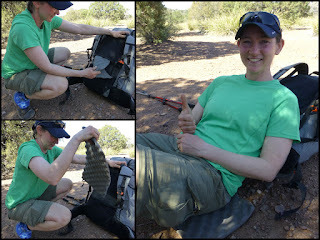 I became a Trail Ambassador for Gossamer Gear, so some may think my review here would be biased. Not the case. I will wear my pack at least 10hrs a day for the next five months. I would not be using a pack unless it was functional and comfortable. 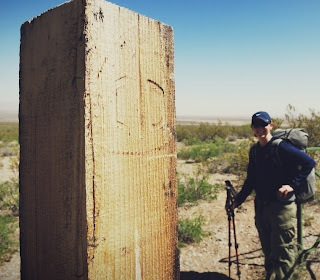 Of the three items I changed, the Mariposa Pack saved me the most weight. It is over 13oz lighter than my previous pack and I’ve found it to be just the right fit for me. 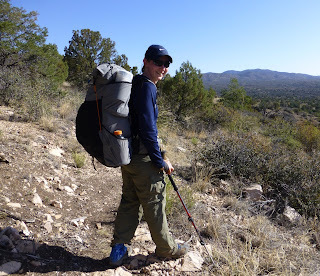 The main thing I like in a pack when thru hiking is how accessible my items can be so that I can spend more time hiking and less time rummaging through my pack to find what I need. I like the abundance of easy to reach pockets on the Mariposa. There are two large pockets on each side that I use to put my water bottles, maps, cook set, water filter, sunscreen, and solar charger. All of these things I can grab without having to open the pack. I’ve always had difficulty accessing my water bottle on the go with other packs. With the Mariposa, I can easily reach back, take a sip and then replace the bottle with little effort. 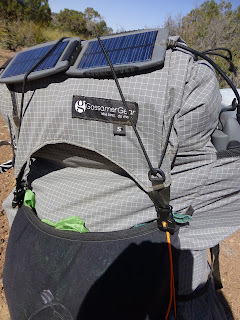 As you can see in the photo on the left, the pack comes with shock cord that can be helpful for attaching things like my solar charger to the outside of my pack. There is also a large mesh pocket in the back I used to easily stuff my jacket, bandana, or random things I’ll need on and off throughout the day. The hip belt also has two decent sized pockets. In one pocket, I’m able to keep up to three bars as snacks. In the other I keep my camera. I’ve found that the pack does well with heavier weights too. There have been many days when I need to carry 4.5L of water and I the pack has handled that well. It feels compact and controlled while I’m wearing it, which has been difficult for my to find with my small frame. I definitely recommend this pack. Especially those of you looking to reduce your base pack weight. I know that everyone needs to find what works for them and that not all packs fit everyone the same. I recommend giving it a try. The one last feature, I’d like to mention is that the back support doubles as a sit pad! At first, I didn’t think I’d be able to easily remove and replace the back pad with a full pack, but it actually works! I was able to get rid of my old sit pad (which was much thinner) and save another 1.5oz. It’s the little things like this that just make my day! Happy Trails everyone!